Secure cargo with a design inspired by nature. The Spidy Gear® Cargo Webb features a patented design that holds loads atop your motorcycle securely and with style. The heavy-duty cargo web is easy to install on any motorcycle or ATV rack. Don’t go another road trip without securing your gear with a Spidy Gear® Cargo Webb! Spidy Gear® Cargo Webbs' patented web design focuses the net’s strength at the center of the load. Heavy duty 6mm, 100% stretch shock cord radiates out from a stainless steel center ring. This design creates a downward force as the cords are stretched taut and secured to the cargo rack. Even and uneven loads will be secure as you travel. Spidy Gear® Cargo Webbs return to their original shape after use. Each web retains its shape and stretchiness. With every use, you’ll get the same tight, secure hold. Installation is simple and takes just minutes. Spidy Gear® Cargo Webbs include mounting hardware that works with your motorcycle or ATV's existing cargo rack. Spidy Gear® Cargo Webbs are not just functional – they’re stylish. They are available in four colors that resist fading. Choose from red, black, green, and yellow. Spidy Gear® Cargo Webbs have a 90 day warranty. If you want to utilize your motorcycle or ATV's cargo rack, don’t take any chances with bungee cords or ropes. 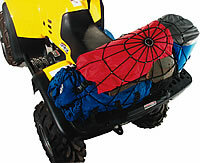 Securely fasten your gear to your ride with a Spidy Gear® Cargo Webb. Expands from 18"x24" to 25"x30"